It goes without saying at this point that the Marine Corps is facing a changing environment, both tactically and politically. It’s obvious in many ways, from the way the Corps recently launched its first assault on pirates in years to the hard realities Marine officials are considering right now as part of a force structure review. The focus is wide-ranging. 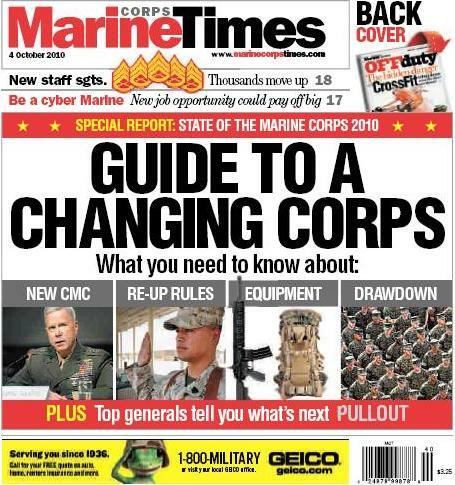 In a special pullout section, Marine Corps Times covers everything from gear to education to the present state of affairs in Afghanistan. The issue’s publication was timed to coincide with Modern Day Marine, the Corps’ premier military exposition. The event will be held from Tuesday to Thursday at Marine Corps Base Quantico, Va.
We ought to adapt and stay very agile. That is the key issue.